Let’s face it. A motorcycle GPS is expensive. Especially for a device that will only be used part time. It’s time to go full time. At least in terms of driving. We’re going to show how to use a motorcycle GPS in a car. Garmin was the first to think about doing this. As part of the first generation was the Garmin Zumo 550. You could use this motorcycle GPS in a car right out of the box. The initial purchase included a special mount and DC power cable specifically for use in a car. 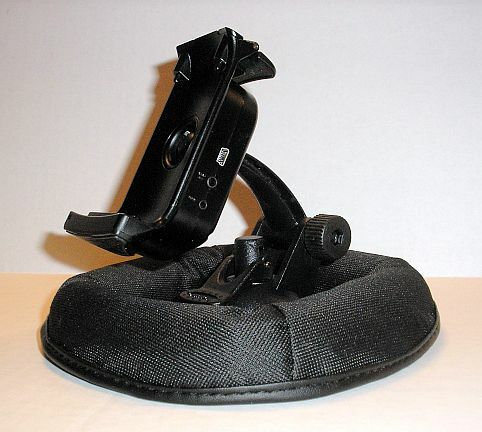 In fact, that’s the Garmin Zumo 550 car cradle on a bean bag mount in the photo that accompanies this article. Now for the most part, Garmin has included a kit to use their motorcycle GPS in a car with the majority of the Zumo since that original Zumo. That’s a nice touch and appreciated by those not needing to buy a second GPS for their automotive travels. TomTom wasn’t as thoughtful with their TomTom Rider 400. A full motorcycle kit is naturally included, but nothing for the car. Fortunately, the TomTom Rider 400 Car Mount is available to solve the problem of how to place their motorcycle GPS in a car. This additional accessory includes the custom cradle, mount and DC power to hook it up in the car. Using a motorcycle GPS in a car likely means you need different hardware. For most, the handlebar mount won’t cut it in the car and neither will the hardwire power. Removing the hardwire from a motorcycle repeatedly is time consuming and can potentially wear out the wires prematurely so it’s not recommended. As already discusses, many of the Garmin motorcycle GPS devices include everything needed for a ride in the car. Those made by TomTom may not include a mount, but they can be purchased individually. One of the things that makes a motorcycle GPS unique are navigational options that make riding more fun. Options like using curvy and hilly roads, while appreciated on a motorcycle, aren’t going to be as appreciated by your passengers in a car. Nor will they be appreciated by a driver on the way to work. Turn off the options to favor your motorcycle ride. Also be sure to turn off any options that are used to track your motorcycle rides because they will function as normally in the car as they would on the motorcycle. For example, the Garmin Zumo 595LM has a trip gauge to help plan gas consumption. There’s also a nicely integrated service log history so you can track when it’s time to do routine maintenance such as change the tires or air filter. Turn these off to prevent inaccurate alerts when placed back on your motorcycle. A nice feature of almost any motorcycle GPS is that it integrates well with Bluetooth. However, it won’t integrate unless you initiate it. Be sure to pair the motorcycle GPS with the car’s Bluetooth system. You just need to do it the first time. Lastly, give some consideration to GPS placement. Most motorcycle GPS devices are larger and heavier than a car GPS. If using a windshield mount, that won’t be an issue. However, the added weight makes placement in some other populations problematic. For example, mounting a motorcycle GPS on the car air vent isn’t recommended die to the weight. Having your car air vent fall apart because a heavy GPS is hanging from it makes for an interesting but expensive story at the repair department so try to stick with locations that can support the weight. The windshield or dash are typically the best locations. Put it somewhere that doesn’t block your view of the road and won’t require taking your eyes off the road.